Family: Mother, Doreen, (53); Father, Michael (53); older brother, Michael Jr.(27); younger sister, Amelia (19). Theresa's parents were both born in Charlottesville, and were high school sweethearts. They tell that story every year on their anniversary, and Theresa still doesn't believe it. ("That whole love-at-first-sight-I'll-be-with-you-forever thing...please!!") They married right out of high school and both attended the University of Virginia. Her father majored in Economics, and her mother in Media Studies. Michael has dark brown hair and gold brown eyes, stands about 5'11", and has a quick, easygoing smile. Doreen is smaller, about 5'3", with blond hair that has a violet cast to it and dark brown eyes. When Michael Sr's grandfather died unexpectedly a few years later, they moved to Roanoke to be closer to his grandmother and help her settle things. When she died a year after that, the home was deeded to them in her will. They remain in that home, and their children have grown up there. Theresa's mother was a stay-at-home mom until Amelia was 7, at which point she went back to her chosen profession: a copywriter for the Associated Press. Her father is Postmaster in Roanoke. Older brother Michael (goes by Mike....NOT 'Jr.') is married, 5'11", an executive for United Way, and currently lives in Minnesota with his wife (well you would hope!) Tracy and their 2 year old girl, Helen. He has sandy-brown hair and stands about 5'11". They see him and his family for most holidays. Amelia (goes by 'Ams') is attending Hollins University for a major in Biology, and works part time at the college's library. She has sandy-brown hair as well, her father's golden brown eyes, and her mother's height. School: Graduated from Hollins University with a degree in preliminary law, and is trying to decide how/when/where to choose a graduate school. Still has ties at Hollins, i.e. her younger sister is currently attending. Likes: Rush (the group, not Limbaugh). Jethro Tull. Some 'modern' classical music, like Mussorgsky. Underdogs(no, that's not a band. I don't think, anyway). Mad TV. Providence (the show, not the place). Jujubes. Dislikes: Bureaucracy. People who take ten days to do something it should only take 5 minutes to do. HMO's. Celery. Being made to repeat herself. Repeat herself. Repeat herself. Fav. Food: Rice, with cream of mushroom soup thrown in it. Hey..it's comfort food. Hated Food: Canteloupe. Most melons, really. But canteloupe in particular. They always seem slimy to her. Fav. Subject: When she was in college, it had to be Sociology. She loves throwing around theories on social mores and why stereotypes are so prevalent in nearly every society. Hobbies: Collecting those old glass insulators off the top of phone poles. You know, they look like wavy ashtrays. Kind of hard to find now. Used to make her brother and his friends climb up for them. Now she looks for them at garage sales. Which segues straight into hobby number two, garage sales. Other people's stuff is fascinating to look at. 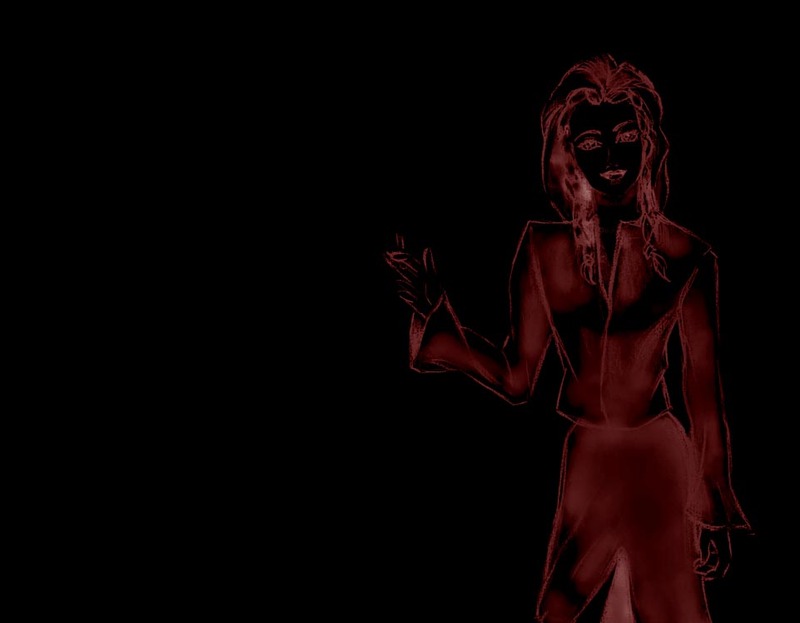 As Tisiphone, to find her sisters, Alecto and Megaera (the other Furies.) There's a power they can only throw when all three are together. No telling what that is, yet. She'll gain her true form once all three are together (Eternal, you could probably call it). According to legend, the three sisters have bat's wings, and tend to run around bearing torches and wearing robes. Not the fuzzy terrycloth ones, either. Well, they also have snakes for hair, but for asthetic reasons we won't really get into that. She'd like to get married eventually and have children without losing her individuality. When she marries, she wants it to be forever, wants there to be no doubt in that decision. Theresa was born in Roanoke and has lived there all her life. Her first and best playmate was her older brother Michael, as they were relatively close in age. That changed when she was 6, as Mike spent more time with his school friends doing 'boy things', and Amelia was born. Theresa realized she had a new, much better playmate, and threw herself into helping her parents with her little sister. It was like having a real doll, and she doted on the little girl constantly. She's still protective of her, but tries to give her some space. When Amelia was old enough--4 or 5--and things got better for the family financially, they began planning summer vacations. They've been to Niagara Falls, the Grand Canyon, the Great Salt Lake, Disneyland, all the really typical family vacation tourist spots. Theresa enjoyed every vacation, right down to the long car trips and long waits in line. Despite all the places she's seen, she would still rather live in Roanoke. It's home. Now that the kids are older and not as enthusiastic about the trips, their parents go on their own. All through grade school, Theresa found herself acting as referee between her friends when they got into disagreements on the playground or during some neighborhood game. She's never minded the task. What her friends seemed to never realize is that when one did something cruel to another, she made sure something of equal proportion was set in place to happen to the perpetrator. Well...within reason. Theresa became interested in sports while in middle school, particularly gymnastics and softball. She trained with an actual gymnastics coach after school for two years before breaking her ankle while sliding into home during a softball game. The ankle never really quit bothering her, so she gave up the gymnastics but played softball right through high school. She attended William Fleming High and maintained a 3.6 average, feeling that getting all A's all the time meant you weren't really learning anything since screwing up (and learning how to deal with it) is part of life. She never sacrificed a social life for her studies, never skipped a grade, and despite her best efforts never got detention. She wasn't a class clown--she simply had a smartass answer for nearly everything. Most teachers regarded her mouthiness as a sign she was actually paying attention, and she avoided trouble. She worked at the student store during her junior and senior years, worked on the homecoming commitee, and giggled at the cheerleaders. Just before finals in her senior year, a bat flew in her window and proclaimed himself her guardian and told her she had responsibilities. Of course she laughed and tried to smush him with a broom. But he got her attention eventually, and handed her a very ancient Roman coin. He asked her to carry it with her everywhere she went. It took a while to sink in, but she got used to the bat and the whole strange nonsense of the things he said. She began attending college and got her internship at a local law firm (the same one she became employed at) and still the bat bumbled in the window at night to talk to her. She got her own apartment during her first year of college, and the bat followed her, saying he was 'preparing' her for what was to come. The bat explained that she needed to know who she was ahead of time, before the fighting really started, so that she could accept it and gain power from the knowledge itself. To this she responded, "What--am I fermenting?" The bat kept telling her 'all in due time'. Theresa has come to understand the conflict she'll be involved in--at least as much as she can without being involved beyond drop-kicking any other team she comes across now that she's one of the Romanus Girls. She has often wondered why everyone is so divided, and what the final goal would be, but realizes that she has a specific place in the scheme of things, and she concentrates on that. Tisiphone, Fortuna and Bacchus were involved in the first sensi-related death in Roanoke - the night Hades died (see season I, 'The Cards You're Dealt'). It sparked a string of more violent events between the teams. Theresa currently works at a small law firm in Lynchburg (Wilkes, Marren and Silovski) as a senior paralegal. It's about 50 miles and more than an hour away, but she won't consider moving from Roanoke. She doesn't mind the commute, since her car (a 1999 Dodge Neon, bottle green of course) has a great stereo system. It didn't come with one, but she fixed that. She lives alone in a 2 bedroom 2nd floor apartment, and uses the 2nd bedroom as a study/thinking place. She keeps her computer in there, some art work and framed posters on the walls, her stereo, and nothing else. It's her 'uncluttered' place. The rest of the apartment is decorated pretty haphazardly with her telephone pole insulators, concert posters and family photos. She has a boyfriend, Rob Townsend, whom she met at Hollins in her sophomore year. He was a year ahead of her, so he's a year older. No, it wasn't a 'love at first sight' thing. She doesn't believe in it. Rob is about 5'10", with sandy brown hair and brown eyes. He's a practical joker, and spoils her. But basically, they spoil each other. They're best friends. They love to go driving around sightseeing on weekends, occasionally getting 'lost'. He works for Virginia Power. References available upon request. Update: Theresa's regular nightly goings-on that she can't explain have made him very suspicious. The couple has been arguing a lot as a result. The relationship is currently on hold. Theresa tends to blurt out what she's thinking at inopportune moments. Not to be overly blunt or mean; she really can't hold on to a thought that long, that's all. Being the middle child in a family generally means never getting a word in edgewise, and needing to talk fast. So she lets it all out. That doesn't mean she doesn't think about it first. She isn't randomly sprouting inane platitudes or stream-of-consciousness witticisms. She's telling people what she really thinks, without padding it until it's a non-statement. She can occasionally be uncharacteristically flip, and has moments of sheer silliness where she'll laugh at something only she can find humor in. Then she can't stop laughing, and trying to stop makes it worse. Other people trying to make her stop--such as in the middle of her classes when she was at school--makes it ten times worse. She has a sharp sense of humor and tends to make smart remarks at nearly everyone, as often as she can. She's hypoglycemic and has hypothyroidism, which means she eats nonstop and her thyroid is misbehaving by barely working. It also means she'll 'crash' if she hasn't eaten properly or on time (shaking, disoriented, sleepy). If she doesn't keep her thyroid meds carefully regulated, her weight balloons and she can be a very pudgy girl. She is constantly hungry, and gets damn mean when she is. It's like living with Jekyll and Hyde. Drop a healthy snack and back away slowly. On her bad days, Theresa can be rigid and pessimistic. You can argue up one side and down the other with her, and she'll set her jaw and ignore you even if she knows you're making perfect sense. She knows she's being stubborn, and she'll probably apologize later. But it's hard for her, because she hates to apologize. If you've done something thoughtless, you'll have to atone for it properly, or you simply go on being guilty in her eyes. And that's not a good thing. Taking personal responsibilty for actions is a big deal to her. On her good days, she's one of the funniest people around, patient and practical. The ideal coworker and friend, a good listener, a shoulder to cry on. You just have to catch her at the right moment. She tends to be disciplined when it comes to herself and her own habits, but not with others. Rob can throw something on the floor and keep doing it for weeks, and she'll go on telling him patiently to please knock it the hell off. Unless she's hungry. Then she yells. She'll simply do something similar to the person annoying her, to show them what it's like, over and over. But she doesn't easily forgive her own mistakes, and goes on telling herself to do better. She's very level-headed most of the time, and as long as she can find a sense of purpose or establish a goal in something, she'll set her sights on it. She smokes when she's nervous, because if she doesn't, she'll eat more instead and throw her body off. She'd rather smoke than replace her wardrobe again. It happens very rarely, and she knows it isn't good for her. She'll smoke a couple and put them away again. She's done this since high school without ever making a habit of it. As to why she gets nervous, it's got to do with making desicions. She always wants to make the correct ones, in every little thing, and she's afraid she won't. She has no trouble making decisions in her professional life--she's very intelligent, which is why she was promoted from intern to paralegal while still at Hollins. She knows what's good for business. She knows how to make a project succeed. But her personal life is something else, and she'll second guess herself into the floor. She doesn't quite trust herself sometimes. She doesn't remember a time when she didn't feel that way, so she's pretty sure it's how she's built. She doesn't like to ask anyone to do something that she's capable of doing herself. She's a rotten delegator and occasionally overworks herself as a result. Theresa is an average 5'6", roughly anywhere from 120 to 160. Wispy build when she's taking her meds like she should and really not wispy at all when she isn't, or she doesn't eat right. Her hair is amethyst colored, very straight, and past her shoulders. She usually wears it down, with the front done in small braids that hang straight on either side of her face, which is slight and oval. She's a sun worshipper and doesn't care if it's good for her or not, so she's tan in summer and pale in winter once it wears off. And she has little crows feet at the corners of her eyes, partly from sun, partly from laughter. Her eyes are a very dark violet with gold flecks, and she needs glasses to be able to drive. Sometimes she wears the specs just to intimidate folks by peering at them over the tops. That's generally when she hasn't had enough to eat, tho. Her eyebrows are slightly heavier than *she* feels they should be, but they certainly don't join into one giant eyebrow on her forehead. She doesn't bother to pluck them, either, so she's obviously not too upset about the whole thing. She feels nature made her the way she is, and she'll leave well enough alone. She has her father's wide, expressive mouth (it's pretty expressive verbally, too, as I mentioned earlier). She's usually grinning with it if she isn't deep in thought. She tends to look pissed off when she's thinking, and it puts folks off. She never quite realizes she's doing it. She has the faintest crossbite (yes--slightly over on one side, slightly under on the other) that isn't that noticible when she grins, but there are some words she can't say without a little too much *hiss*. Nature made her that way, too, so braces weren't on her itinerary as a kid. Her hands are slender and long-fingered, piano player's hands, but rough. She's not afraid to get them dirty. Her nails are always neat and well-trimmed, since she used to bite them as a child when she was nervous. Ever since she broke that habit in her teens (by replacing it with smoking), she's been careful to keep them trimmed so she won't revert back to it. She likes to be dressed down when she's not at work--jeans, t shirts, baseball cap. But she would never consider running to even 7-11 in just sweatpants and a t shirt, she feels that going out in public like that is 'sloppy'. A minimum of jeans and well-brushed hair are called for when going out in public. She loves turtlenecks and light jackets to go with jeans when she's out somewhere with Rob.When she's at work, she sticks with the basics--matching jackets and skirts, what she calls 'chick suits'. Nothing loud. She doesn't like heels, and only owns one pair for special occasions. She can't see ruining her feet when flats look just as nice. If she could wear tennishoes all day, she'd do that. She likes darker colors, forest greens and navy blues with lighter colors to offset them. Her makeup is kept simple and plain--some eyeliner and mascera, in earth tones, applied to look like she isn't wearing any. She doesn't need much, since she has a good complexion and long eyelashes of her own. It's more that it's a ritual of 'putting on her work face'. She steers clear of lipstick, as her mouth is already prominent enough. Chapstick has to do, on wintery days.